he SM86 with the SLX2 transmitter features the SM86 cardioid condenser microphone head which is tailored for smooth, warm and rich vocal reproduction. The SLX2 Wireless Handheld Transmitter includes a timed backlit LCD display, frequency and power lockout, and "Mute" functionality. It works with the SLX4 receiver. This transmitter requires the SLX4 receiver to complete the system. 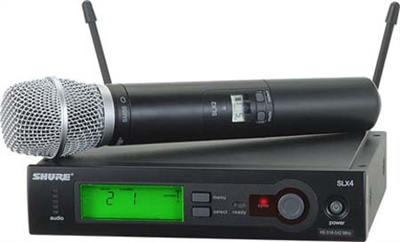 All Shure wireless transmitter designs allow for interchangeable microphone heads.